77 properties found. Return to search results. This is a large detached villa with private pool, in a sought-after area of Nerja, close to both the beach and town centre. It is an ideal villa for a large family group or for two families travelling together. Entering the spacious house you come to a large entrance hall. From here there are two entrances to a large double lounge/games room, a cloakroom and spacious kitchen. A door from the kitchen goes onto a small hall and to a twin bedroom with ensuite bathroom. From the lounge there are patio doors onto a covered terrace for dining and the pool terrace. Upstairs are 4 further bedrooms, 2 with double beds and 2 with twin beds. The double bedrooms have an ensuite bathroom and ensuite shower room. There is also a further full bathroom. From the master bedroom and one of the twin bedrooms patio doors open onto a large terrace, a good part of which is enclosed and used as a further lounge/gym. This villa enjoys an unbeatable location in Nerja, close to the exclusive Parador Hotel. 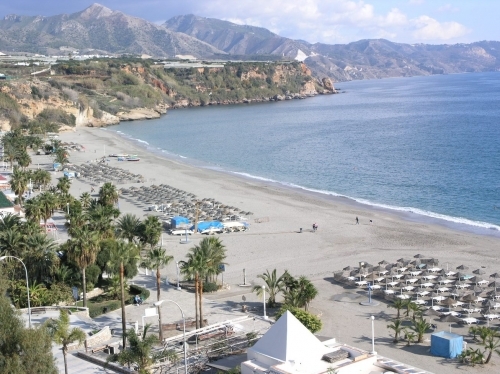 It is in a residential location which is just 10 minutes from Burriana Beach and 10 minutes from the Balcón de Europa, the very heart of Nerja. Christmas & New Year: 22/12/19 - 6/1/20. The booking deposit for this property is 30%.